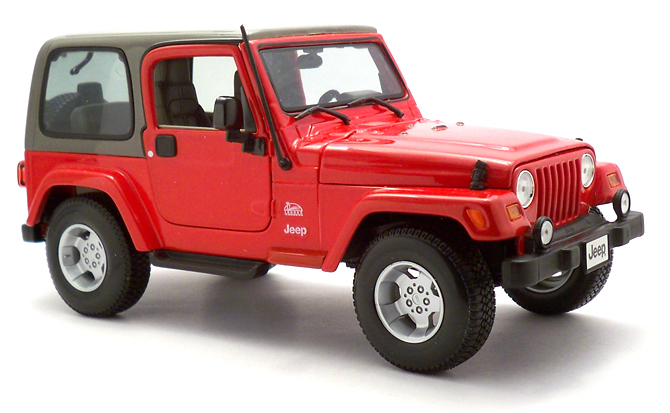 The Jeep Wrangler is a compact four-wheel drive sport utility vehicle produced by Chrysler under its Jeep marquee. It is a successor to the famous World War II ‘Jeep’ vehicle by way of the Willys civilian Jeep (CJ) in the 1950s. 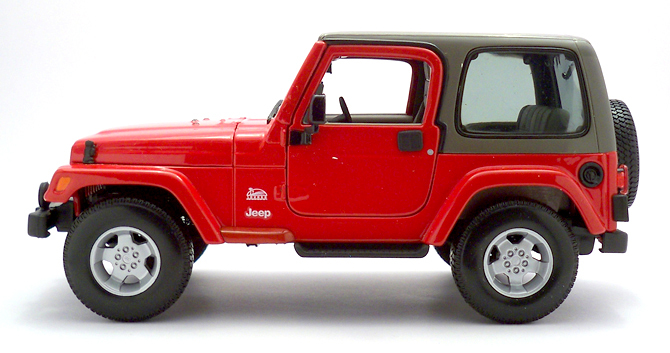 The Wrangler debuted in 1987, was revised in 1997 and again in 2007, and is still popular today. 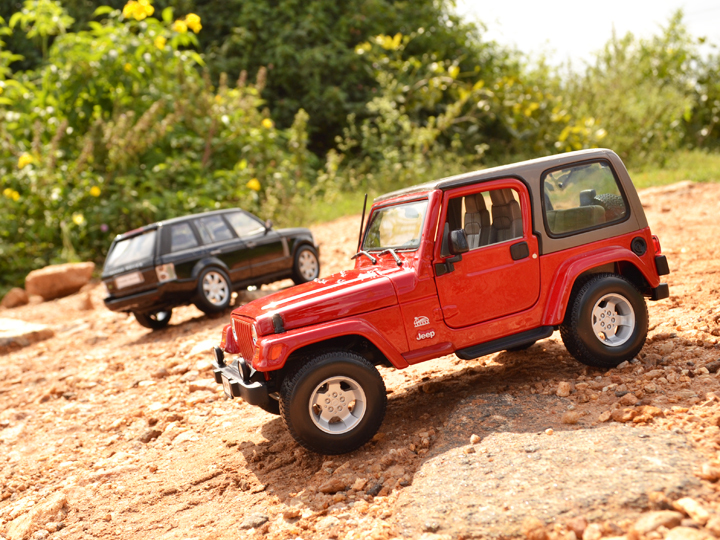 The Wrangler is also known as the YJ, TJ, JK, and J8 (Military version). 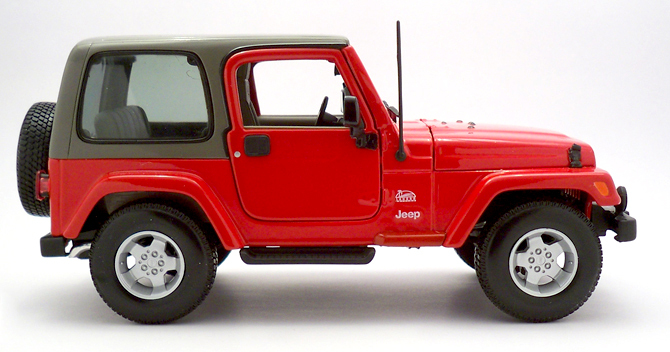 The TJ version of Sahara has the “Sahara Edition” decals on the side of which essentially differentiates the TJ Rubicon and Unlimited in terms of exteriors. 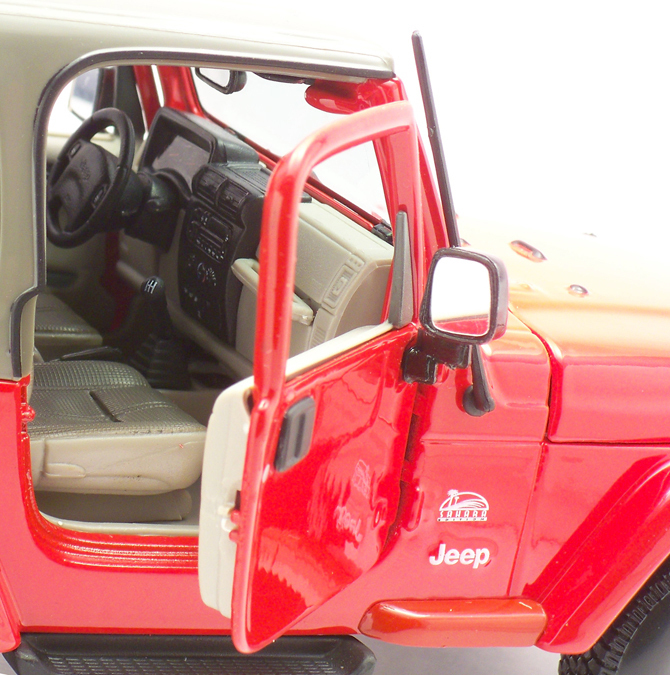 The Sahara also come with a hardtop options and full doors some version even had air-cons, power windows and automatic transmission. 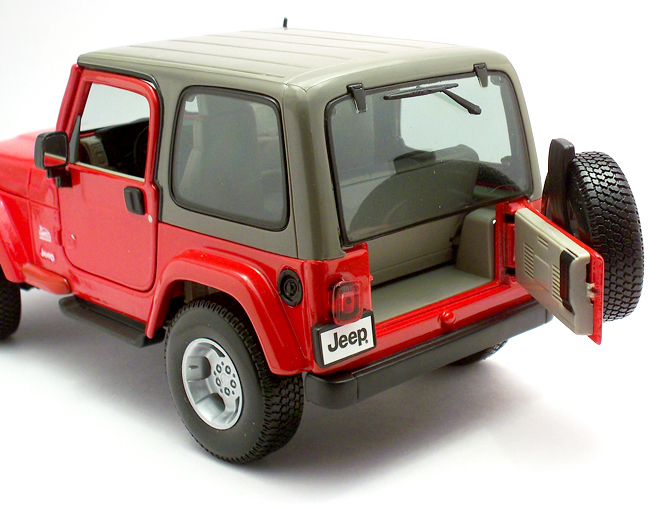 This is the second Jeep (first being the Jeep Wrangler Rubicon – Brush Fire Unit) to hit my showcases that too in the same color as older one. 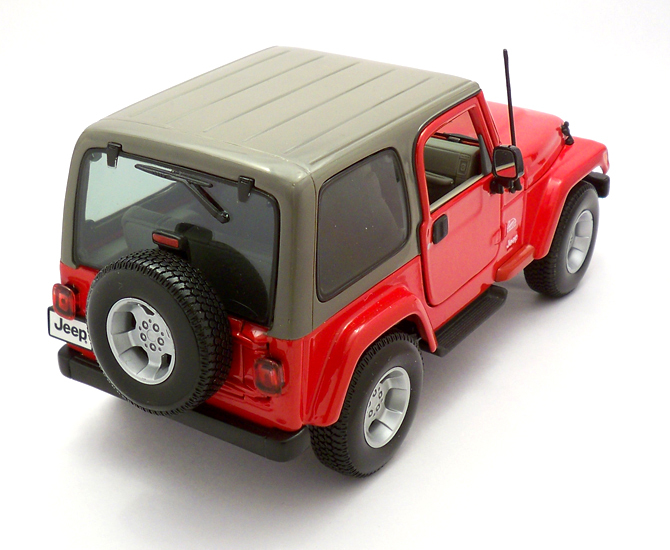 As both the Jeep are TJ versions and in red means more confusion for a new observer but this guy is a hardtop version, which gives some relief on ¾ viewing angles. Bburago made Sahara matches in looks, bodywork and shade in most respect. The bodywork is amazing, paint job is top notch and hardtop is shiny plastic would have been great if that’s done in matt finish. 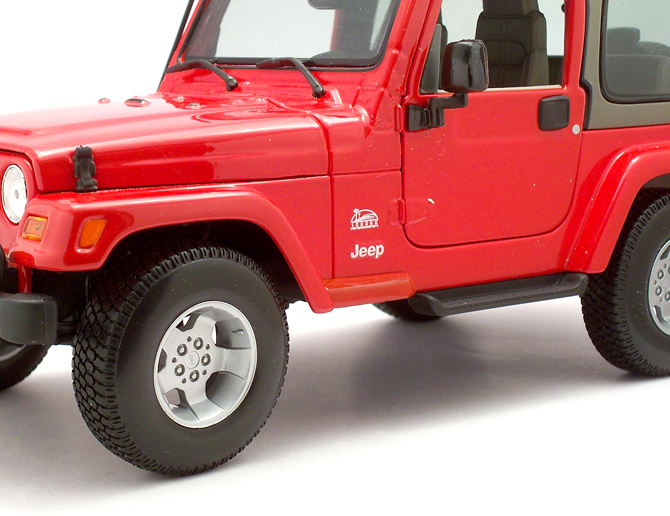 The Rubicon’s front-end is identical to the Sahara; apart from the aluminum addition in the bumper and crash guard distinguishing the Rubicon. 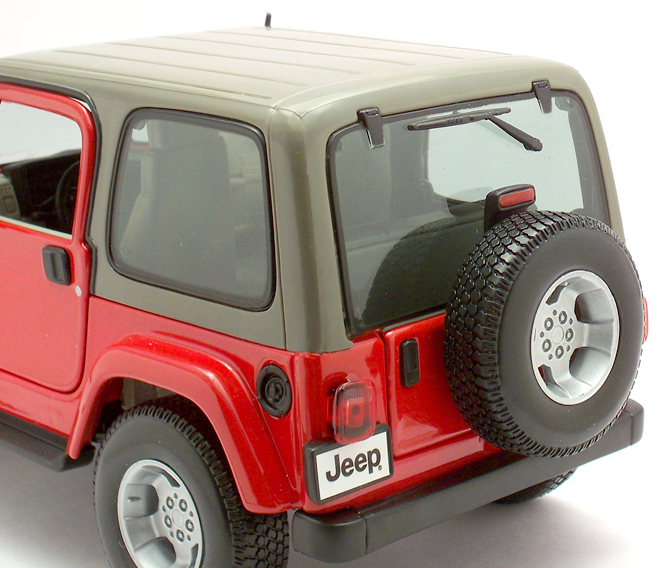 The rear-end is way a mile different from my Rubicon, thanks to that chunky gray large windowed hardtop. The rear window is kind of interesting because it has hinges to assist the rear hatch and the much expected wash vipers. 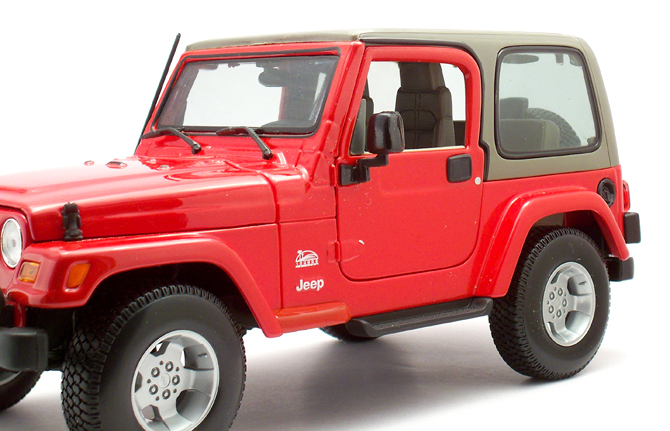 The profile view reveals more civilized look to this ultimate badboy; though the hardtop is the main and easily notable change, this guy also gets all body colored wheel arcs (unlike the Rubicon’s partial black), additional protection underneath the Jeep Logo on the sides, foot pads for easy getting in and out and finally the full door with a fatter door knobs. The Alloys look much simpler though five spokes adds a very urban look, tires compliment that with a regular on-road tires. Radio reception antenna is bulky but nice to have one in a budget model like this. Now lets get inside! 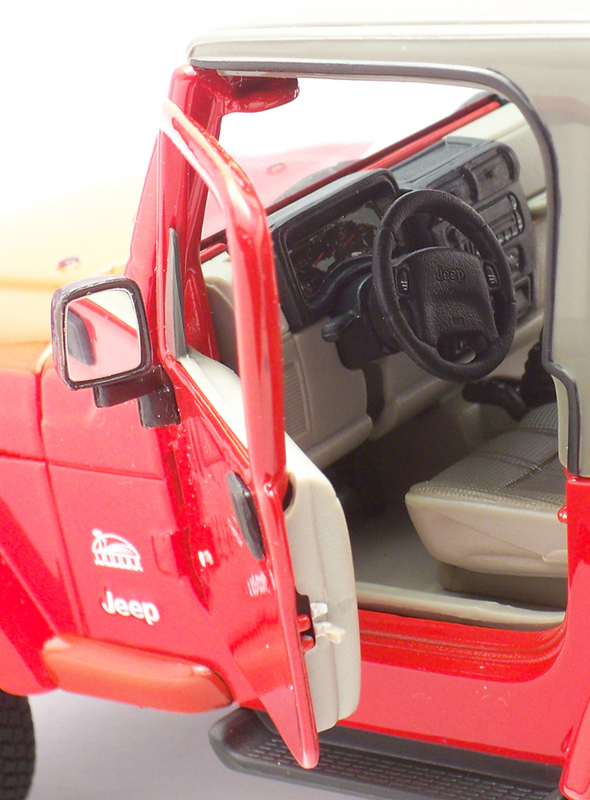 The interior as expected is made of plastic but some great details thrown in. Unlike the other Jeep (Rubicon) this comes with a manual transmission, which means the gear lever is different and quite smart, but unfortunately pointing to the rear. Being a manual it also get an additional paddle for the clutch. The Instrument console is all black and the steering wheel is wide and chunky. 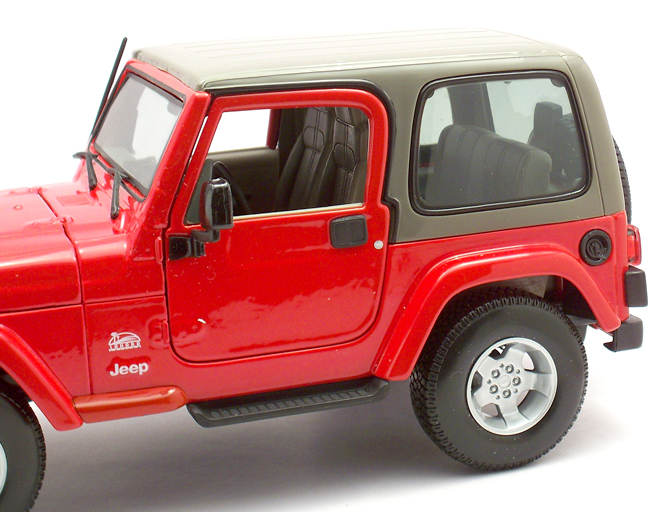 This Sahara comes with pale gray upholstery (but the Rubicon gets an all black upholstery) matching the hardtop, apart from the color the design and texture is great and works very well with the rest of the interior trim. This guy come with all usual stuffs like functional steering system, detailed engine bay and opening doors and trunk door partially. The rear door mostly disappoints me as it opens up only the lower part of the trunk door (i.e. swing door) and hatch is sealed. That something which haven’t expected! The doors are kind of spring loaded, which feels good when opening and closing those doors. 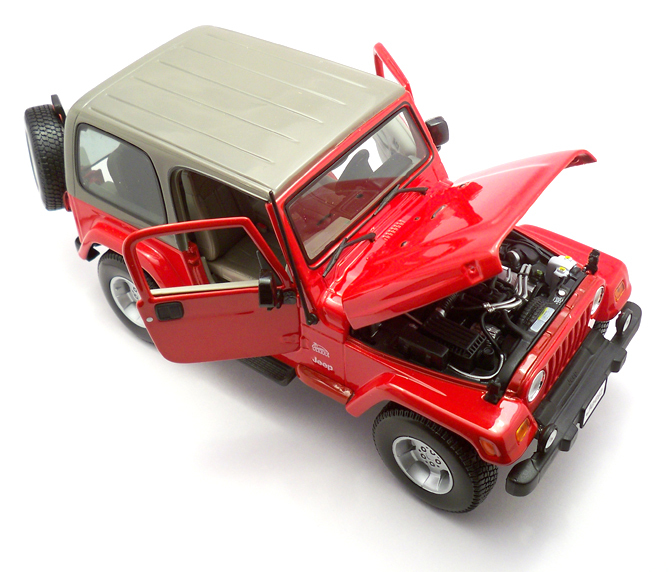 The engine bay is detailed too but the real catch for in here is the bonnet and the holding locks, which is very nice and works perfectly, I guess I can even take this guy off-road. The engine is nicely finished in black, white and aluminum shades but they are greatly composed to get a very attractive package. The piping is also done great accuracy and they show up. 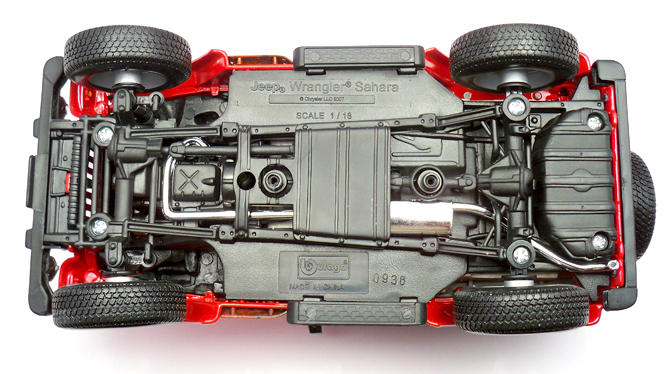 All Bburago models like Maisto have great underbody detailing, and this with its exposed mechanics and all wheel drive system lets to more crafting opportunity. The all chrome exhaust system is visible only in this view and Bburago gets a bravo for this. Three things I love about this car: The “SAHARA EDITION” badge is one of my favorites because it is sharp, smudge free for its small dimension and the design itself. I did try to find the generation of this Sahara with the logo but interestingly dint find any but one tire cover with this logo. I can easily be called as a footwear lover both in real life and in cars so this my ultimate priority the alloys wheels and the tires. The alloy in this car is neat bright and chucky. The simpler and more sober design takes away some of the Jeep’s buch look but translates well in transforming this off-roader to suit the indented on-road usage. The tailgate gave me some surprise, as it is not fully operational but managed to get a spot in my heart. The hatch hinges and the wash viper addition are something that got me by surprise and very camera friendly. 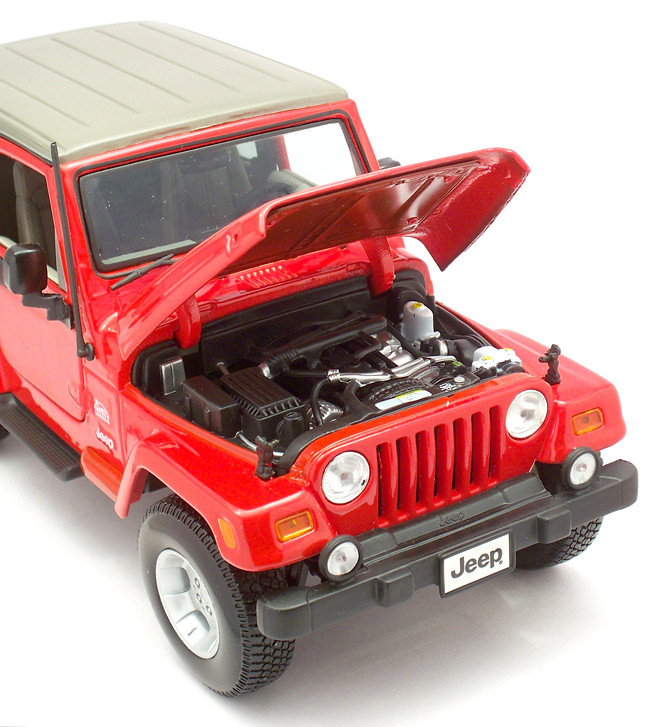 This is one of the long awaited models and so I guess I did a very detailed review. There are no complaints except few disappointments but they are normal sometimes-even brand like AUTOart and Kyosho fall into this situation. So Bburago gets a thumb up? 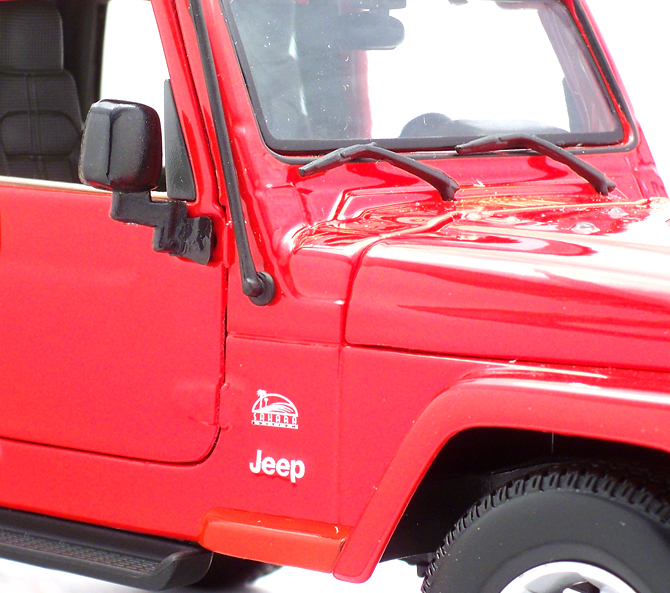 Yes they do, not just one but two; one for the making this Jeep with so much details and the other for making it in my favorite red color. Bravo! Gr8 review. I’m in <3 with it. How I wish I had this instead of my Maisto rubicon. Thanks Arkin, both these models are brilliant! worth a place in any collection. I was planing to buy one of these and found your review..great review. I wanted to know if this has a working suspension I mean with shocks etc and do those wheels roll? Do the wheels rubber tyres or they are hard plastic? 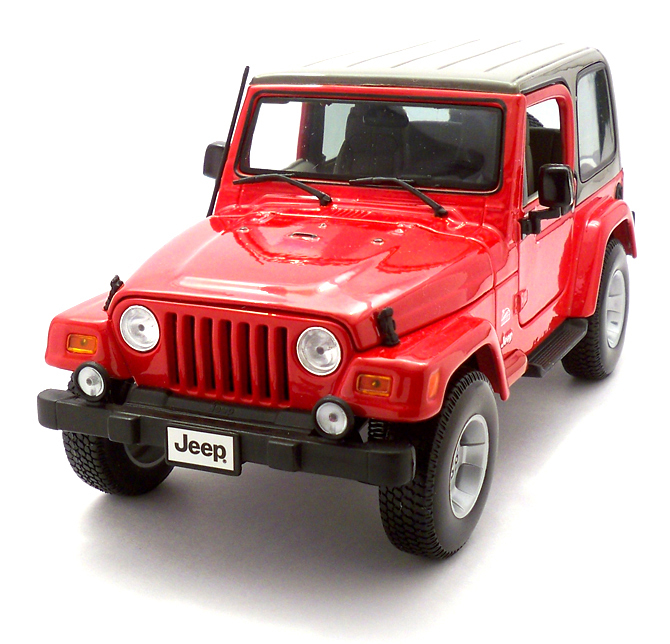 This being a 1:18scale from Bburago it comes with working suspension, rolling wheels (front wheel even turn) and the tyres are rubber.